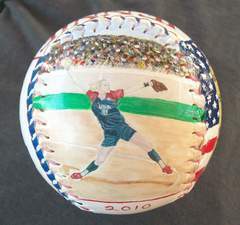 This Great American Jennie Finch Softball features two of my paintings of the greatest softball pitcher ever. 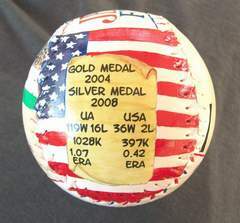 A certificate of authenticity comes with your ball so that you know it's an original Great American Softball. 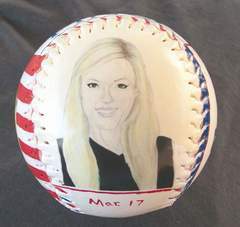 Side one is my close up painting of Jennie Finch. Click here for a closer look. Side three shows some of Jennie's important statistics and awards with the American flag in the background. 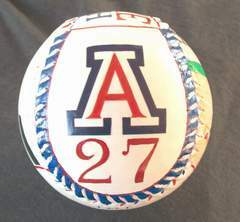 Side four is Jennie Finch's hand painted University of Arizona logo and her famous number 27. 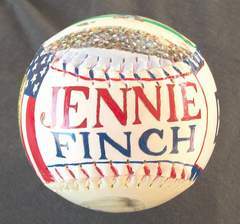 Side five, which is the top of the ball, has Jennie's hand painted name timmed in red, white and blue. 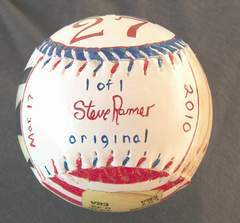 And side six, which is the bottom of the softball, has my signature and the date this Great American Softball was completed. You'll also see "1 of 1". This means that this is number one of only one created. It's a one of a kind piece of art work. I'll never create another exactly like it.